As a rule, whenever I find myself in Tokyo on a clear day, I check to see what’s going on at the Mori Art Museum. There, high above Japanese Gotham, in the upper-echalons of the Roppongi Hills Building, I can enjoy not only the first-rate exhibitions put together by the trusty and innovative curators, but also my continuing birds-eye explorations of the ever-so-hard-to-get-a-grasp-of capital. 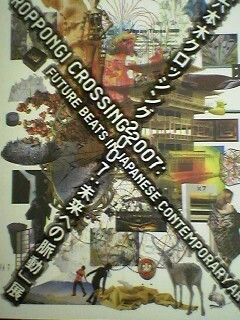 When I found out that a show called “Roppongi Crossings 2007: Future Beats In Japanese Contemporary Art” was on, I had a hunch that if I went I would be in for an especially rewarding visit. I’ve always had a soft-spot for contemporary art, which if not always beautiful in a traditional sense, could at its best be eye-opening, exciting, disturbing and extremely funny. It can also get you to look at life and the world around you in a new way. Such an exhibition would be a perfect accompaniment to the views of Tokyo, that sprawling cubist-study-of-gray-on-gray, and most contemporary of first-world cities (if Jackson Pollack were an urban planner, might not he have conceived its crazed concrete mayhem with his random drippings?) which can be had from the observation deck just a floor below (by escalator) the museum. I enthusiastically suggested to the friends I was with that we make our way toward the elevator (we were conveniently lunching at Roppongi Hills) and head up to the 52nd floor. We were not to be disappointed. We purchased our combination ticket for 1500 yen (didn’t it used to be more expensive?) giving us access to the museum as well as to the observation deck. Our ears popped as we were whisked with surprising speed up to our high altitude destination. When the doors opened we walked out into a dazzlingly clear view of the megalopolis, which turned into a full panoramic view as we slowly made our way around the glass-lined periphery of the building. From up here, we can try to put the puzzle of the city together. As we are accustomed to shuttling underground between our favorite districts, emerging out of subway stations or walking down from trestles makes it nearly impossible to form a mental picture of the city. My geographical understanding improves with each trip up to this floor and I would recommend it as a perfect starting point for a first trip to Tokyo (just as I would suggest starting a Kyoto tour off at Enryaku-ji Temple on top of Mt. Hiei). For Tsukuba-ites it is especially interesting (and moving) to gaze out in a straight line beyond the green oasis of the Imperial Palace, at the irregular M-shape of Mt. Tsukuba. It can be seen how the Chuzen-Ji Temple, now Mt Tsukuba Shrine, was the protector of the unlucky North-Eastern Direction of Edo Castle, mirroring the way Enraku-Ji protects the Kyoto Imperial Palace’s unlucky direction. You can come back to this floor again and again to try and pick your favorite haunts out of the confusion. In the distance are Mt. Fuji, Tokyo Bay, Boso Peninsula, and Haneda airport. Trying to find Meiji Shrine, Tokyo Dome, Budokan, etc. can be much more difficult than finding Wally. Just as the view calls for repeated visits, I find myself usually coming back again and again to each of the exhibits I’ve seen at the Mori, which occupies the interior of what I guess is the 53rd floor (access is one floor up from the observatory by escalator). The Crossroads exhibition will have me back again as well. The curators have selected works in various media by 36 artists/collectives to represent the Japanese art scene of the past few decades. Before showing your ticket and taking the escalator, you might not be able to pass up giving Kohei Nawa’s musical fountain a turn. What can be more irresistible than making music and water flow at the same time? At the top of the escalator you can check your bags and coats and maybe pick up one of the free audio tour contraptions, which provide explantions and interviews with some of the artists. Then you head into the thick of it. For the next 2 hours I found myself surprised, puzzled, amazed, and even tearing uncontrollably with laughter. Let me walk you through the exhibit for a brief tour of my favorite works. You are greeted first by Tatsumi Yoshino’s bronze dog-head, followed as you turn the corner by his larger, Christ-like, twisted and emaciated hounds. No-one can be sure what these can represent (even the artist), but for me they were moving tributes (bronzes are usually reserved for people who have made significant contributions to society) to dogs and other animals who have suffered and died for the sake of mankind in medical and other scientific experiments. In the same room are Tiger Takeshi’s surreal trips to Mt Fuji and his spacey comic strips. Opposite this is a very large and sharp photo of a garbage dump in what appears to be a Middle Eastern country. Many visitors stood around it,scouring it for details. Entering the next room, the lights comes slowly up and down on Chu Enoki’s terrifying and beautiful city, or planet, of scrap metal. It can be viewed from within or from a separate viewing platform. From either, it is unforgetable. Another room has Shinichi Hana’s bizarre white marble sculptures which contain enough details to elicit lengthy (and puzzled) viewings. They certainly get you racking your brains for possible meaning ( I must admit that I came up with nothing). You then enter a room with what is possibly my favorite work, Takahiro Iwasaki’s Out Of Disorder installation, which at first appeared to be a large room strewn with several pieces of dirty laundry. On closer inspection, however, and then by actually getting down on hands and knees, you can find tiny sculptures made out of pencil lead, mounted strategically on the socks, T-shirts, and underwear. Just as the stones in a zen garden can represent islands, mountains, or countries, you can see whole worlds in the laundry lying on your floor! I had such a feeling when I came to Yoshino Yoshimura’s corner. The wall seemed to be adorned with sheets of newspaper. A closer examination seemed to confirm this. Checking the explanation plate however, I realized the impossible (and possibly ridiculous) fact that these were hand penciled, exact copies of newspapers! I had the same feeling again with Yoshio Sagishi’s tiny ceramic constructions which were painstakingly made, drop by drop. Koichiro Tsukikawa’s video works also shows fabulous intricacy and detail. I will mention one more work which left an impression on me, and this installation surely pushes the definition of what art is to the limit. With their Arithmetik Garden, Sato Masahiko and Kiriyama Takashi have created a mathematical puzzle which the visitor tries to solve by passing through various gates. I was completely stumped, and had to let my friend’s young daughter finish things off. When I soon found myself at the exit of the exhibition, I was overcome with disappointment. I didn’t want it to be over. But it will be on until January 14, 2008, so I’ll be going back. Especially on clear days, when I can enjoy the exhibit, and the view.